A new study by the National Print Owners Association (NPOA) as highlighted in a recent article from PI World reveals the latest pricing practices for 18 of the industry’s most popular substrates. 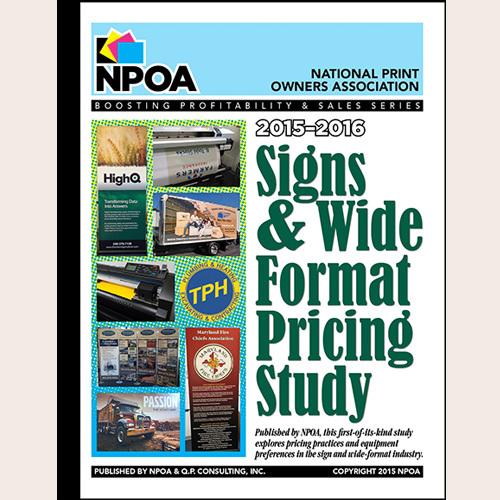 “This is an industry first and provides printers with a real-world look at pricing, products and practices they can use to fine tune and build their sign and wide-format business,” said NPOA Executive Director and study author John Stewart. Pricing information is also included for many of the more popular products including Coroplast, aluminum signs, square-cut and contour-cut decals, simple vehicle decals, flat surface vehicle wraps and window perfs. The study, which surveyed 230 small commerical printing firms, also showed that sign and wide-format sales accounted for an average of 9.8 percent of total sales, with the top quartile of companies by sales boasting $417,000 in sign sales, or nearly $35,000 a month. “The full study is a valuable resource for all Print Service Providers needing guidance on how to price wide format jobs, whether they’re new to the market or expanding their product offering,” said Heather Roden, Associate Product Marketing Manager, Fujifilm. NPOA members can download the 44-page Executive Summary of the study for FREE at the NPOA Bookstore. The full study is available for purchase for $117 for NPOA members and $195 for non-members. Interested in becoming a member of NPOA? Visit NPOA Membership Options for details.